Hopefully you had a successful 2017 and a good start into the new year. 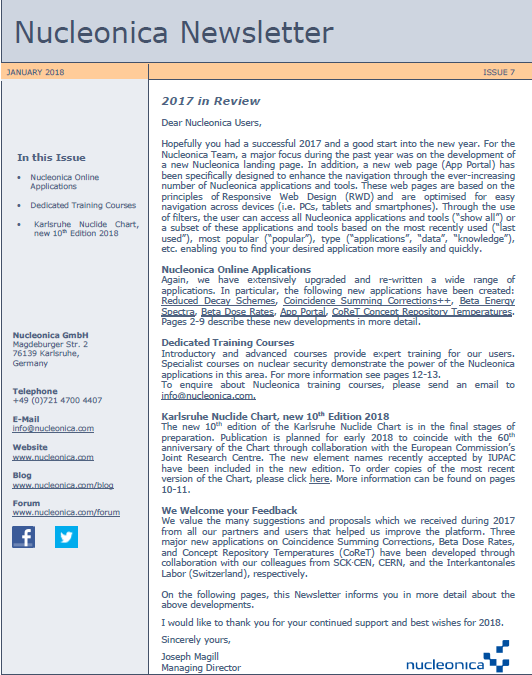 For the Nucleonica Team, a major focus during the past year was on the development of a new Nucleonica landing page. In addition, a new web page (App Portal) has been specifically designed to enhance the navigation through the ever-increasing number of Nucleonica applications and tools. These web pages are based on the principles of Responsive Web Design (RWD) and are optimised for easy navigation across devices (i.e. PCs, tablets and smartphones). Through the use of filters, the user can access all Nucleonica applications and tools (“show all”) or a subset of these applications and tools based on the most recently used (“last used”), most popular (“popular”), type (“applications”, “data”, “knowledge”), etc. enabling you to find your desired application more easily and quickly. Again, we have extensively upgraded and re-written a wide range of applications. In particular, the following new applications have been created: Reduced Decay Schemes, Coincidence Summing Corrections++, Beta Energy Spectra, Beta Dose Rates, App Portal, CoReT Concept Repository Temperatures. Pages 2-9 describe these new developments in more detail. Introductory and advanced courses provide expert training for our users. Specialist courses on nuclear security demonstrate the power of the Nucleonica applications in this area. For more information see pages 12-13. To enquire about Nucleonica training courses, please send an email to info@nucleonica.com. The new 10th edition of the Karlsruhe Nuclide Chart is in the final stages of preparation. Publication is planned for early 2018 to coincide with the 60th anniversary of the Chart through collaboration with the European Commission’s Joint Research Centre. The new element names recently accepted by IUPAC have been included in the new edition. To order copies of the most recent version of the Chart, please click here. More information can be found on pages 10-11. We value the many suggestions and proposals which we received during 2017 from all our partners and users that helped us improve the platform. Three major new applications on Coincidence Summing Corrections, Beta Dose Rates, and Concept Repository Temperatures (CoReT) have been developed through collaboration with our colleagues from SCK·CEN, CERN, and the Interkantonales Labor (Switzerland), respectively. On the following pages, this Newsletter informs you in more detail about the above developments. I would like to thank you for your continued support and best wishes for 2018.